Why am I thankful creativity continues to flow through me daily? The Great Shift is not a single moment in time, but an eternal doorway that invites you to connect to the eternal holy energy in the base of your heart. Every time you connect to the core of your heart, you are experiencing the Great Shift with Gaia and all beings. So many people around the world have been guided by the light within to prepare for this special time on Earth, as this is the time we may all receive the higher frequency of light directly from Gaia for our great shift into our Hearts. THE GREAT SHIFT – 12.12.2012 to 21.12.2012 from Sri’ama Qala on Vimeo. The Chant is “Om Maya Ma Kita Raku Ana Peya Namu” meaning “In Oneness with the Universe, I am the holy vessel, receiving Gods love and wisdom, in divine service to all Beings”. The chant sounds like this “Oh Maya Makey Tara Coo Ana Peya Namu”. I have included this chant into my meditation, experiencing a deep connection and you may as well. This gentle chant sooths my soul like no other. Inside the core of the Earth, Mother Earth’s beautiful heart energy is amplifying to a crescendo in light vibration. This is an auspicious time for all on Earth, offering a great blessing to all who wish to receive their Divine Presence. At the core of your heart, lays the source of your divine energy, the eternal holy flame of your soul. This holy flame connects you with all of life, the unified field, the infinite sea of God’s Presence. Activated and enlightened, the holy flame of your heart releases love and light to all in the world. Through your open heart as you give, you receive the love and light of all beings. Another meditation tool I use is the HU song. Similar to Buddhist mantra, Aum or Om. This is an excellent sound for bringing us to the mental level of our inner being. Our inner being consists of our emotions, our memories, our mind, our intuition or sub consciousness and our true selves, Soul. Simply, quietly in your mind during the day sing this note HU or sit in meditation to sing HU out loud. We are spiritual Beings trying to cope with a human awakening. This song helps link us up in the spiritual realm. At one time when I was thirteen years old for the next six years, I was a Buddhist with Nichiren Daishonin Soka Gakkai. I traveled to Japan for their special Temple dedication at sixteen and chanted in temples with thousands of other Buddhists chanting Nam-myoho-renge-kyo. Wow… the memory of energy in the temples still resonates with me to this day decades later. I have included this chanting back into my meditation practice as well as I kneel in front of my beautiful statue of Kwan Yin, my dear beloved sister gifted me, the female form of the Bodhisattva of compassion. 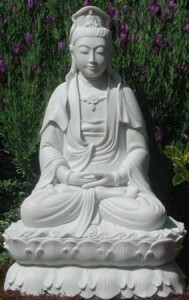 Kwan Yin is an ancient goddess with her roots deep in Asia however, she is not an image to be worshiped, but to keep where we can see her so she can reflect our own innate qualities of calm, compassion, strength, and beauty. In seeing these qualities in her, we feel them awaken in ourselves and it is easier to act from there.